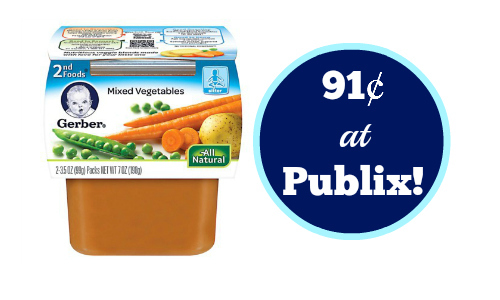 Home > Baby Deals > Gerber Baby Food Coupon | Makes it 91¢ at Publix! Gerber Baby Food Coupon | Makes it 91¢ at Publix! If you have a little one, print a new Gerber Baby Food coupon to get a great deal at Publix! The deal is available 6/5-6/11 or 6/4-6/10 (depending on your area). You can see all of the Publix deals here. Like getting it for 91¢ ea. !